Loving The Alien: E.T. The Extra-Terrestrial | "DESTROY ALL FANBOYS!" The best film directors are master manipulators who can magically transform an entire theater audience into a group of happy to sappy sapient lemmings or wide-eyed marionettes easily controlled from start to end credits. Their best films have the masses cheering the heroes, hissing at the bad ones, empathizing with the downtrodden and generally feeling whatever emotion a scene calls for. Yes, there are exceptions to this non-rule (too-likeable villains, swapping out all attempts at sympathy for more explosions and eyeball rolling plot twists you can see coming 20 minutes before they occur). But when you get right down to it, you know your cinematic needs are being taken care of when certain directors are at the helm. In other words, this is a Spielberg film, folks. Rather than do a by the book review of E.T. 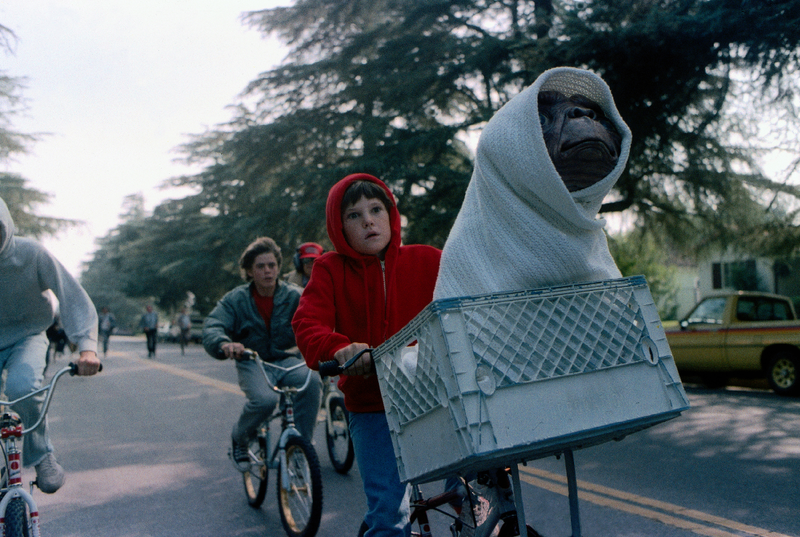 The Extra-Terrestrial (probably one of the most reviewed and re-reviewed of Spielberg’s films), this post is going to take you back to two specific moments in time where I saw the film with others and that crying stuff happened exactly as if scripted and studied by a bunch of strangers. If you have yet to see this classic, go do so – it’s a magnificently human film even if the sci-fi elements might not be your cup of tea. While not a proper sequel at all to the more epic Close Encounters of the Third Kind (another film that’s a must-see if you’ve never taken the ride), some thematic and visual carryover make it quite the companion piece. I’ve heard E.T. called “corny” and worse by a few cranky cross-armed types who inhabit darker places online so often that their cheerlessness could probably turn clear water to mud with a dead-eyed stare. Their loss, I say. One thing Spielberg nails here and through much of his work is an eye for human nature in regards to reactions to events mundane to miraculous, often with a sense of wonder activated at crucial moments. Couple that with capable actors, a truly stirring soundtracks (mostly by John Williams), and yes, hefty studio ad budgets and you get pretty much movies for the masses that aren’t guilty pleasures (well, unless you’re talking about 1941, but that’s a movie that makes me cry for all the wrong reasons). In a nutshell, the plot: An out of this world plant collection team rousted by government agents who’ve tracked them down, flee in their ship but leave one member stranded. That alien finds his way to a home where a young boy named Eliot (played by Henry Thomas) and his fatherless family live. Initially frightened, Eliot tempts the alien with candy, takes him in and hides him, eventually revealing him to his brother and sister. The boy and alien develop a telepathic bond through which odd, amusing trouble happens at school. But more trouble arrives as the agents again track the alien down at his most vulnerable moment. Things get extremely gloomy, but miracles of a sort occur, there’s a chase, an escape and emotional finale. By the end, you’re probably out half a box of Kleenex thanks to that director guy putting together some excellently crafted big and small deal moments. I first saw E.T. on its opening day, June 11, 1982 with a few close friends at a rather large one-screen theater I forget the name of here in NYC. Back then, you planned your movie going organically by following films based on trailers you’d see months or even a year beforehand, then read about those films in assorted magazines as the months passed before finally meeting in front of the theater and lining up with other like-minded fans. Occasionally, some big-deal flicks required an overnight stay in front of a theater (I remember Raiders of The Lost Ark being one and The Empire Strikes Back was another), or sometimes you just made a bunch of phone calls and queued up day one at a sold out showing until the next one was free and hoped not too many people were sticking around for a second or third time. Anyway, I distinctly recall everyone in the theater (save for some wailing too-young children) at that first showing being completely enthralled with the film, laughing at the funny stuff that rolls in as just another routine day in some unidentified suburb somewhere in America. The D & D game and pizza delivery sequence? Priceless. 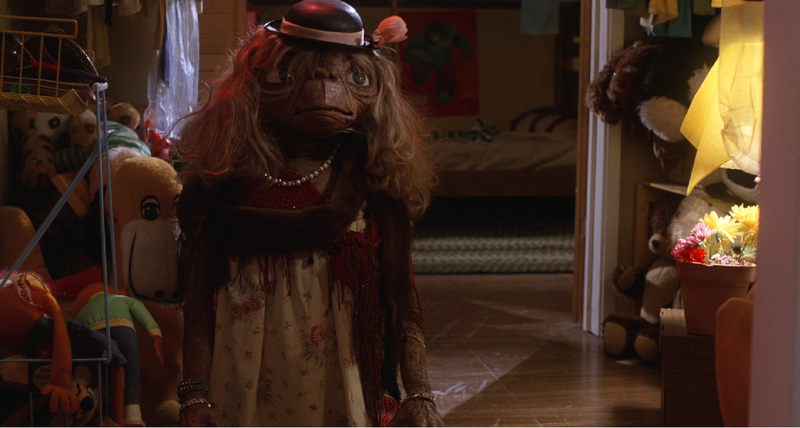 Eliot smuggling his new friend into the house and any of the scenes with Drew Barrymore’s Gertie completely believing she’s interacting with an actual alien, the scene where Eliot and E.T. bond telepathically remotely (Eliot is at school when E.T. discovers beer in the fridge and yep, drunken hijinks ensue). Those moments and more kept everyone glued to their seats to the point where a small horde of the audience did a bathroom dash near the ending of the film and almost missed (or missed entirely) the almost as emotional finale. The omedic scenes were crafted and worked so well that they tuned everyone out perfectly into almost missing those agents giving chase early on. But those strings getting pulled one way as distraction get a hard yank in the opposite direction as Eliot and his alien friend spend an entire night in a chilly nearby forest trying to contact his ship with a homemade communicator. The next few minutes after this are the big hanky moments and not surprisingly, an entire theater of mostly adults can get awfully quiet (save for all those sniffling noises that made it sound like a room full of people at a walk-in clinic). The effective thing about this sequence were the audience investing so much into that ugly animatronic alien that when he ends up on a table across from Eliot, we’re all that bawling kid. Someone later asked me about why that theater turned into a salty swimming pool and I had to think hard about the last time a fictional film that wasn’t a cartoon affected both kids and adults so powerfully. I think that’s the genius of a Spielberg at work with a team of others determined to bring that ham-headed alien to life and make you care about it as if it’s real. Given that MANY other post-E.T. films weren’t as successful thanks to the aliens being a lot less convincing or worse, trying to appeal more to kids and not the adults paying for tickets, having a convincing creature was half the battle. The second coming (heh) of E.T. brought more tears, this time mixed with laughter as the film went from dark and grim to hilariously lighter tone and we got one of Spielberg’s snappy, furiously fun chase scenes as a payoff. The man knows how to shoot a mighty thrilling chase (as evidenced all the way back in 1971’s TV film Duel and later in his first feature film, 1974’s The Sugarland Express, another must-see tearjerker) and the one here involves kids on bikes versus a bunch of government cars and vans. Of course the out of town feds have no chance against kids who know the lay of he land and just so happen to have an alien that can make all their well-ridden bikes fly at just the right moment. Cue the audience cheering, tearing and swearing simultaneously. Of course, the film wasn’t over just yet, closing with yep, another big hanky moment. I saw the film a few more times during its initial run and even though the emotional impact was lessened, it was still a great experience each time. Flash forward a few years to when the film was being trotted out on TV as a Thanksgiving staple and I’m with a lady friend visiting one of her friends who was spending a quiet, rainy holiday alone. Guess what was on TV and guess who hadn’t seen it. Yep, Spielberg’s little lost alien still had the power to two adults who’d seen it already and one who hadn’t into weepy puppets glad they took the trip (despite too many commercials this time out). Oddly enough (or not so oddly), seeing the movie alone had me concentrating more on things I missed from visual effects in-jokes to checking the editing and music cues and finding them just about flawless. If you’ve never seen E.T. and are looking for a home video version, absolutely seek out the double disc set with both the original and 20th Anniversary versions if you want to see how digital tinkering can effect a film’s impact. While the story is unchanged and the added footage interesting, the CG fixes many visual effects but ends up being a wee bit too perfect. 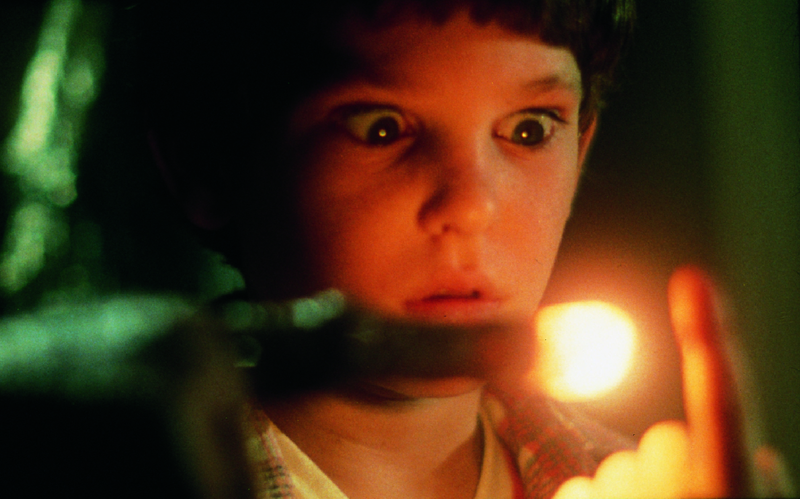 Ultimately the new footage and effects don’t entirely replace Carlo Rambaldi’s hand-crafted original E.T. puppet, a good thing. For me, parts where the CG works best are the opening chase scenes where the original alien stiffly “runs” by seemingly being pulled on a cart of some sort, possibly on a track of some sort. The CG model scampers and hops a lot more like you’d think a short alien with stubby legs would over uneven terrain. Spielberg also had every gun removed from the agents, replacing them with walkie-talkies. While making the film less threatening (and probably tying into the government knowing the aliens aren’t harmful AND them not wanting to threaten to shoot children riding bikes later on). The end result is the lack of firearms makes the chase less dramatic although it still quite thrilling. While it’s not even as close to infuriating as what George Lucas did to his first three Star Wars films, some purists I’ve talked to over the years treat the CG as a big knock against Spielberg for some reason. But I disagree because at least you get the original cut with the new one for a very low price point. It’s funny that Spielberg also added in cut sequences and shot new footage for Close Encounters of the Third Kind: The Special Edition, making it a better film (save for the mall-like mothership interior shots demanded by Columbia, ugh!). You’ll want the three-disc set with all three cuts of the film and all the bonus features as the Blu-Ray just gives you the three cuts and not much in the way of extras. Ooh, look at the time (you’re all passed out, too!). 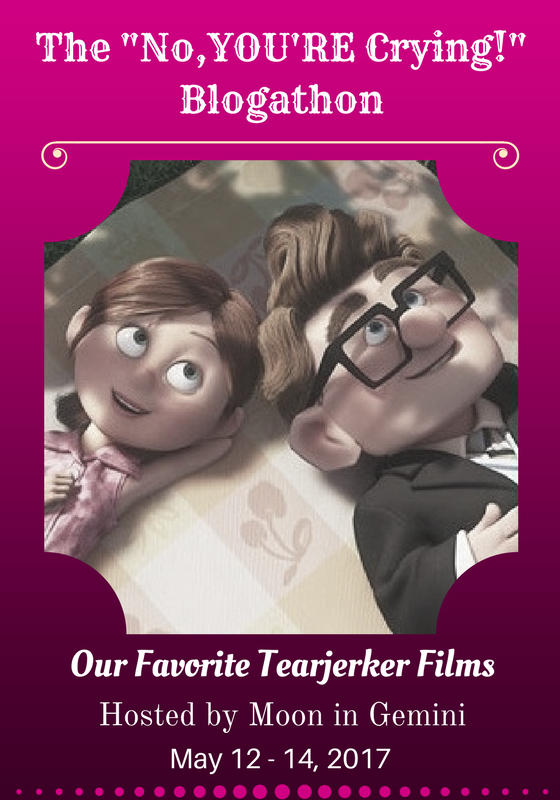 Anyway, this post is part of the “No, YOU’RE Crying!” Blogathon: Our Favorite Tearjerker Films hosted by the magnificent Debbie Vega over at Moon In Gemini. Pop on over thataway starting Friday the 12th to read more posts on other films guaranteed to get you whipping out the hankies or buying a few boxes of tissues for your next screening party. This entry was posted in 2017, Commentary, DAF, Features, Humor, Movie Posters, Updates and tagged 1982, 2002, Blogathons, Classic Film, E.T. 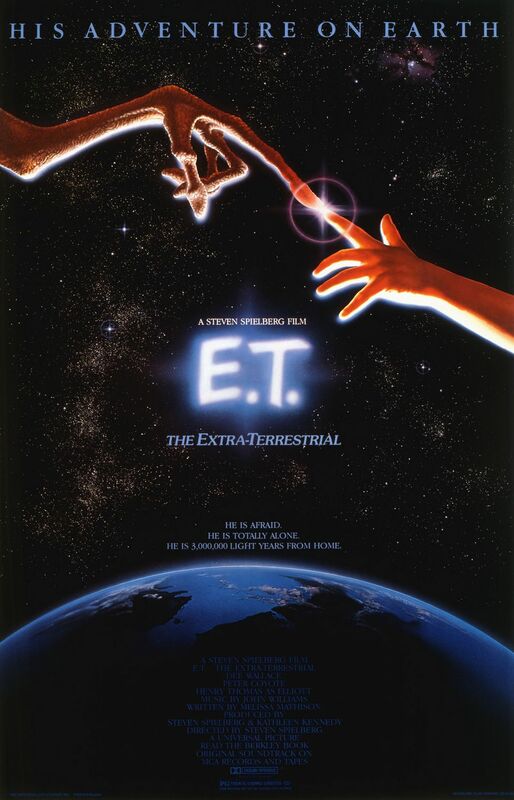 The Extra-Terrestrial, May, Moon Over Gemini, Movie Clips, Movie Posters, Movie Trailers, Movies, Steven Spielberg, The "No YOU'RE Crying Blogathon", Universal Pictures by geelw. Bookmark the permalink. I enjoyed your article immensely. Very witty (I clapped after reading some lines). You brought up memories of my viewing of ET at the theatre, and the orange pop I spilled on a white T (sigh). Oddly enough, I haven’t seen it since despite how much I adored it. If I watch it now, it may be like that first time all over again. Thank you! The film is definitely a classic in that way where you’ll come back to it after a long time and have most of the same responses. I do like that the current disc version has both cuts on it so it can be viewed with and without the big changes. I guess I must be one of those “cranky cross-armed types”, although I really don’t think so. I have always said my basic problem with “ET” probably stemmed from the fact that I waited too long to get around to seeing it. It had been out for about 10-12 weeks, and had been over-hyped out the wazoo by then. Plus I went to see it at a drive-in theater, probably not the best venue for such a movie. As a result, it didn’t live up to my expectations. Even today, I can’t bring myself to giving it a second go. There is no real reason why not, just that 35 year memory that won’t go away. Still I find reading about fans views on the movie entertaining, and this is a good post. Thanks for reading and the reply. These days I watch most movies from the comfort of the couch here and only a small percent in a theater. I can see a drive-in being not a great place to see certain films as I recall going twice as a kid and having odd stuff happen that made the movies less of a main feature. Or… There’s nothing like going to a matinee and seeing something like five minutes of grindhouse nudie trailers because someone “accidentally” loaded the wrong reel. Because there were these comic moments in the beginning, I wasn’t ready when ET got emotional. 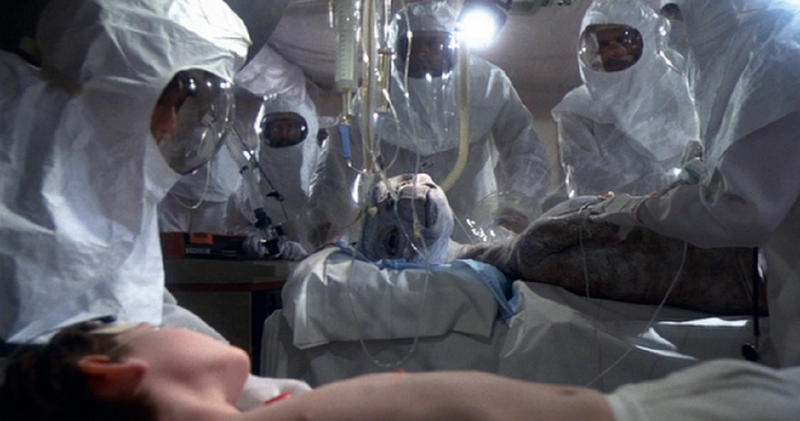 Spielberg in indeed a master for quickly creating a connection between the audience and the alien. And it was very nice of you to share two stories about the movie. Thanks for the reply! I just read your blog post. Nice to know we watch movies in that same stone-like manner. I’d probably not make it through your blogathon pick without getting a bit misty. Your review is sheer delight. I love your phrases: “cranky cross-armed types” and “ham-headed alien”. Priceless! I have to admit I went into E.T. the first time not expecting much–while I have always loved Jaws, I (shush, don’t tell anyone this) never really liked Close Encounters and it took me years to totally appreciate Raiders of the Lost Ark. Wow, did I love this movie on first viewing. I feel that all the tears are earned. The scene that really got me was when Keys tells Elliot he’s been wishing for this since he was a kid. The “villainous” character is really a grown-up version of Elliot. Sob. Thanks so much for contributing this awesome post on one of my favorite films! Yep, I purposely didn’t reveal Keys’ role because he’s that much of a surprise character in the film. That part got me as well. The funny thing about Close Encounters is the longer version makes it a better film…but I’ve always had issues with the scale of the UFOs. One is the about size of a melon and that big city-sized one rotating behind Devil’s Tower should have knocked about 1/4 of it off. I have a very funny story about seeing Raiders on day 1 with a VERY cranky WWII veteran in he row in front of me and his grandson who was having fund despite his grandpa critiquing everything in the film in real time. I think he wanted it to be a documentary or based on a true story!